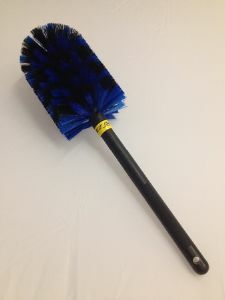 New from EZ Detail - The Go EZ Detail brush! The original EZ Detail Brush is one of our best selling wheel brushes - it bends, curves, reaches and cleans spaces large and small all over your car. EZ Detail have now released the Go EZ Detail Brush for areas that require a stiffer brush when cleaning. The Go EZ Detail Brush has a thicker stem than the original EZ brush. This added rigidity makes it perfect for cleaning the outside of wheels, tyres, bumpers and other hard-to-reach areas of your vehicle. The Go EZ brush still uses the same soft Nylon Nylex bristles, which will not scratch any coated, painted, polished, plated, or blank metal surface. Each bristle has a unique, multi-edge structure that provides excellent cleaning power, and the bristles bounce back to their original shape after each use. The synthetic bristles are chemical resistant, so feel free to use your favourite wheel cleaner. For the best results no matter what wheels you have, we recommend that you always use a water-based wheel cleaner (some examples are shown below). This safe cleaner contains no caustic agents and will not pit or dull any type of coating. The Go EZ brush has an ergonomic plastic handle that keeps you comfortable while you clean and it also ensures wheels are protected against scratches when cleaning. The brush has a diameter of approximately 100mm to also clean large wheel openings. The Go EZ brush expands the EZ Detail range to 3 great versatile brushes. The Go EZ Brush has the same soft non-scratch bristles but uses a different bristle pattern and rigid stem to offer a much different tool compared to the original brush.